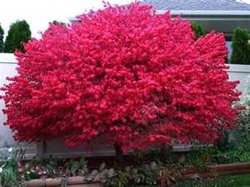 Dwarf Burning Bush is one of the most beautiful shrubs. It becomes a different color with each season. In the spring, green foliage emerges with inconspicuous green flowers which are followed by orange-red berries. In the fall, the leaves turn a brilliant burgundy red. Dwarf Burning Bush likes to be planted in full sun. Once the leaves fall, the unusual corky bark is exposed which adds to the winter appearance of this shrub. Dwarf Burning Bush grows from 4' to 5' tall and 4' to 6' wide. The orange-red berries are a food source for birds. Dwarf Burning Bush is also a Firewise plant.